Just a short post today, I’m tired tonight! 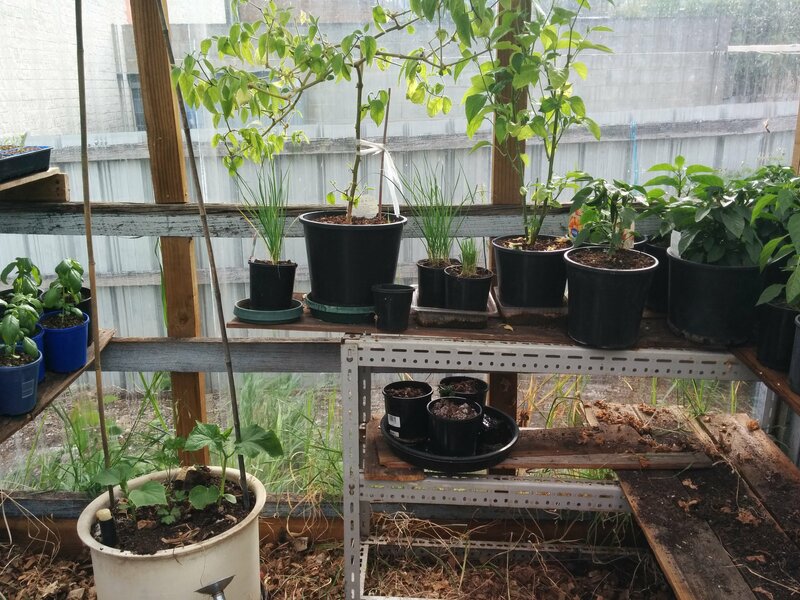 Because we have relatively mild summers here in Tasmania, I grow chillies and basil in pots in the greenhouse so I get the most out of them. When I first moved here six years ago, this was run down shed, full of weeds and cherry tree suckers and it took six months to get it into a workable state. All of the shelving is timber salvaged from the old shed. I’ve been doing yet another clean out of the greenhouse the last couple of days, in an effort to make more room. It’s something I go through every spring as it tends to become a storage space in winter. But this year I’ve got more chilli plants already in pots – and a lot more on the way! So this is what it looks like after today. This is the front half, with a wonderful view to the outside and the main raspberry bed. Inside, there’s Sweet Basil in pots that I’ve already started cropping and two more punnets of Basil seedlings ready to be potted up. The area out of shot holds my eight very productive strawberry plants a storage shelf for plastic trays, tags and toilet roll grow tubes and further left is a bench where I can sit and work. In this photo there’s also vegetables sizing up for planting out in the next few weeks, including zucchinis, beans, various salad vegetables and about 50 Asparagus seedlings. 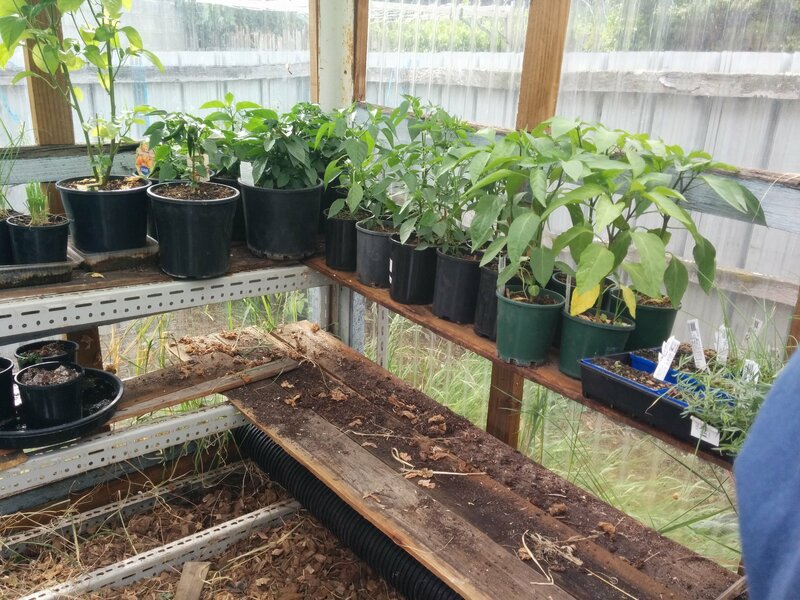 At the far end on the top shelf is a tray with approximately eight different varieties of chillies that need to potting up – so many plants! Following around are mini cucumbers in a tub on the wood chip floor, Garlic Chives about to go out into the garden and my permanent chillies, a Rocoto (Capsicum pubescens), which has beautiful purple flowers and large, very hot fruit and a Scotch Bonnet (Capsicum chinense). On the lower shelf are three pots of watercress, one of my favourite salad plants. The top shelf here is more chillies – did I mention my family love hot, spicy food? – Cayenne, Jalapeno, Habaneros and Thai and the last of the vegetables to be potted up. The lower shelf in this photo will eventually be filled with Mammoth, Lettuce Leaf and Thai Basil. Out of shot to the right is a shelf and small cupboard that might end up being more shelving for chillies! What’s the most productive space in your garden? 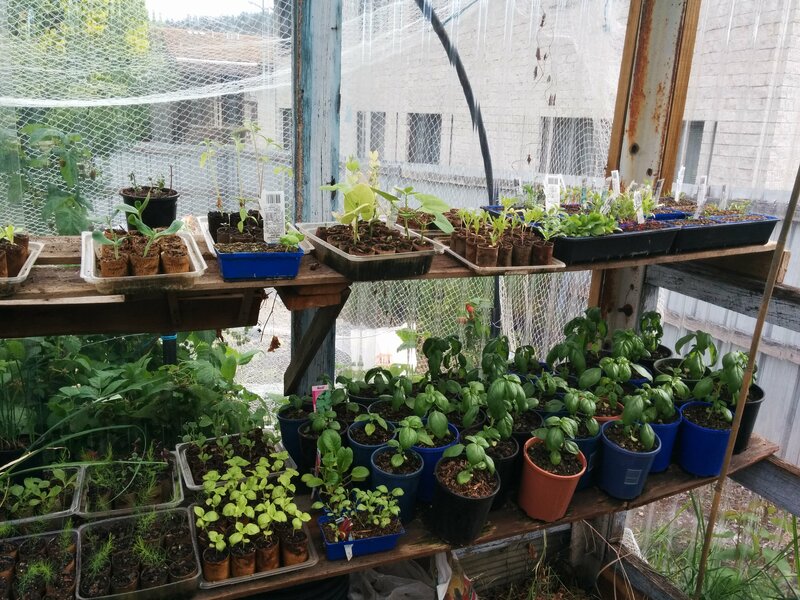 Do you have a greenhouse? Please leave a comment.